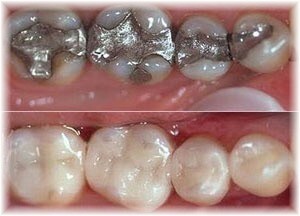 Tired of a mouth full of black amalgam fillings? Experience a CEREC Crown! Dentists of Tasmania in Hobart, just 10 minutes from Hobart Airport, can replace those unsightly large amalgam fillings with beautiful white CEREC porcelain crown and inlay at a fraction of normal costs. Dentists of Tasmania offer a same day service for the removal of amalgam and replacement with CEREC porcelain restorations. No multiple visits required and better still, we offer a 5 year guarantee on our CEREC work. For patients concerned about the removal of the amalgam, we are able to use a rubber dam on request. Call now on 6265 2009 to make your appointment or book your consultation online and quote special offer “2for1”. Bookings must be made by 30 April 2017. Conditions apply. CEREC restorations are strong, durable and look and feel like your natural tooth. CEREC protects your tooth from further fractures and is the ideal procedure of choice to replace fractured amalgam fillings or cracked teeth. It is a conservative way of protecting as much tooth structure and extends the life of your tooth. CEREC can also be used for front crowns and veneers. To find out more about CEREC watch this YouTube clip. We reserve the right to refuse making this offer to patients if you are not a suitable candidate or if we feel that the replacement of your amalgam fillings is unwarranted.